Grammy award-winning rock giants, YES, announce a double-album 2016 Spring UK/European tour. The band will perform two of its iconic albums, Fragile and Drama, in their entirety. 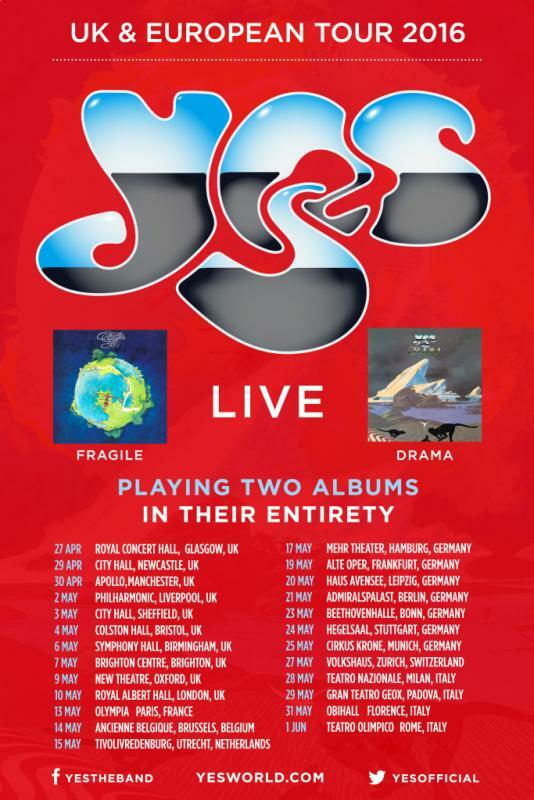 Legendary progressive rock band, YES, will start their 2016 UK-European Tour kicking off 27 April 2016 in Glasgow, Scotland and wrapping up 2 June 2016 in Bari, Italy. On this tour, fans can look forward to a unique YES experience; the band will perform two of its iconic albums in their entirety, Fragile and, for the first time ever, Drama. YES will delight audiences with tracks from two of its most influential albums. Fans will hear long-time favorites, including Roundabout, Long Distance Runaround, Heart of the Sunrise, Machine Messiah, Into the Lens, Tempus Fugit, and more. In addition, YES will perform all the tracks in the order they appear on each corresponding studio album. The UK/European 2016 tour visits 27 cities across the UK and Europe. See below for complete tour itinerary information, including venues and dates. NB: For technical reasons beyond both parties’ control, Moon Safari​ will not be able to join Yes as opening act on the European tour. The band will, however, remain on the bill for one night only to make a special guest appearance at the Royal Albert Hall​ in London on May 10, taking the stage at 7.30. YES wish Moon Safari every good fortune in the future.